Depending on where you live, answering the door can be a somewhat dangerous proposition. Kids, older people and unusually small adults often have a hard time seeing through the peephole. 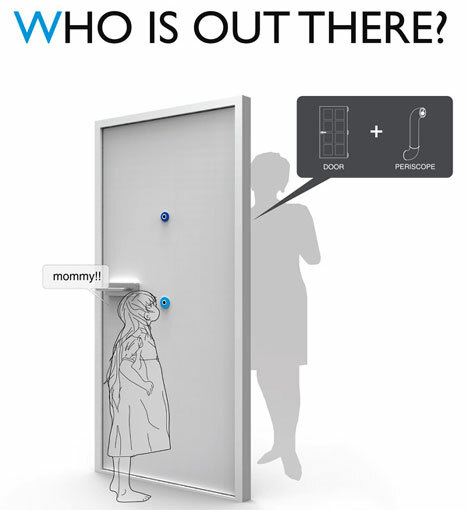 This concept from designer Hyun-June Yang is called Who Is Out There, and it is meant to make answering the door safer for kids and adults who can’t quite see through peepholes placed at standard height. The product would work on the same principle as a periscope. 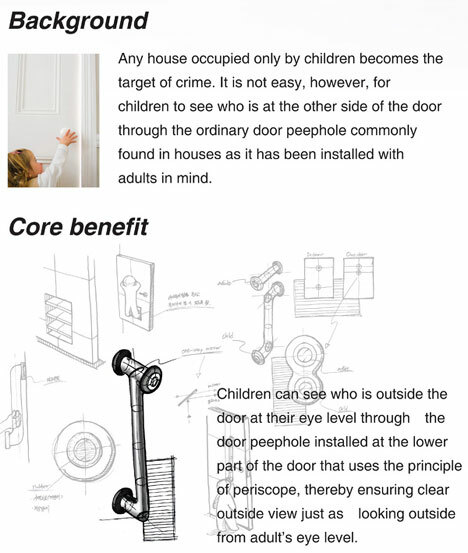 A normal-height peephole would work as usual, but a second peephole would be installed at kid height and the view would be bounced off of a one-way mirror to let the shortie peek into the hallway while not obscuring the view through the adult peephole. We love any product that keeps kids safe, but whether this concept could ever be marketed is doubtful. It would require specialized installation that would no doubt cost quite a bit more than the simple installation of a standard peephole (or even two at different heights). See more in Home & Personal or under Gadgets. October, 2011.